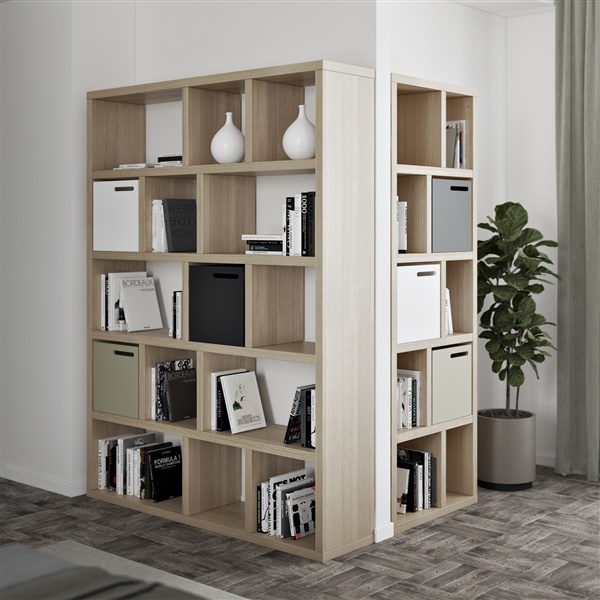 Boasting clean sleek lines and a geometric design, the Berlin 5 Level 59" Shelving Unit will enhance any room in your contemporary home. Each row features one large and two small cubbyholes to display books, CDs, DVDs and some of your most beloved photos. For durability with less weight, the unit is beautifully built of honeycomb inlay framed with chipboard and encased in a medium-density fiberboard shell. It's available in different colors to complement your interior design and can be paired with the optional Berlin Box available separately. Hi, could you provide the height and width dimensions for the smaller and larger compartments? Also will this bookcase support heavy books? Thanks! The dimensions of the small compartments are 13.3" h x 13.75" w. The dimensions of the large compartments are 13.3" h x 25.4" w. The maximum weight limit is 99 lbs. per level.